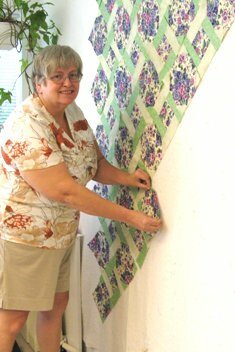 Phyllis and Sharon arrived for their quilting retreat with tons of fabric, ready to make their “Garden Twist” quilts. 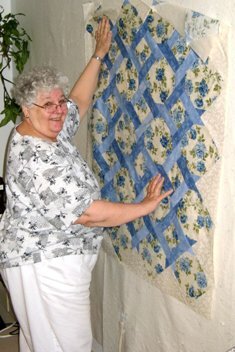 Sharon had not quilted before, and said she did not even like sewing. Hmmmm! 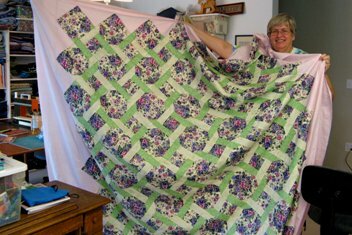 And, the Garden Twist is made up of two different blocks, -- not really a “beginner” project. 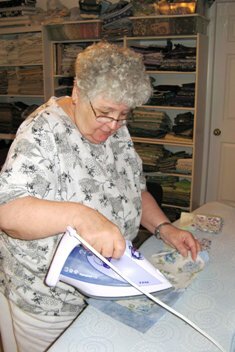 I did a little rotary cutting demo, to make sure we covered all the safety aspects, and then got Sharon cutting her pieces out. 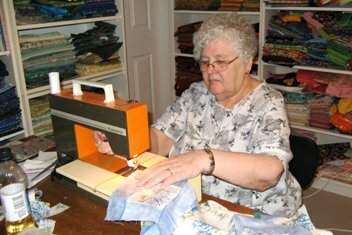 When she had a sufficient amount to get started, I set her up sewing – chain piecing in fact! Being an accountant, she took to chain piecing like a duck to water, and there was no looking back. 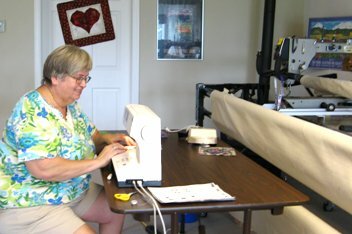 Quilting retreat pictures ... Sharon getting started sewing. .... Sharon has her blocks made, and is placing them on the design wall. 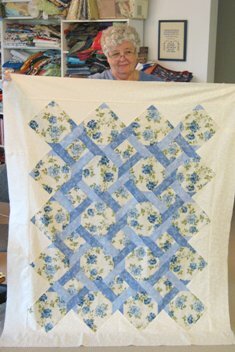 ... Phyllis completed her lap sized quilt top -- its beautiful! ... And the finished quilt top – Sharon, the non sewer has completed a King size quilt top in two days! 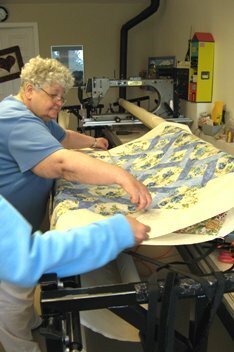 ... Sharon sewing all her rows together! It is just so amazing how much can be accomplished in two days! And that was even with a trip to the quilt shop for more fabric. They were sure happy, and will be back soon!